Breakups can be really brutal but staying in a relationship that you have grown out of can be even worse. 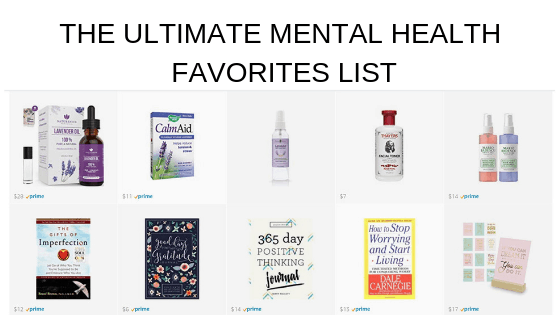 Be sure to check out my breakup survival guide for all of my tips about how to get through a breakup. I also have a whole podcast episode about breakups you can check out here. 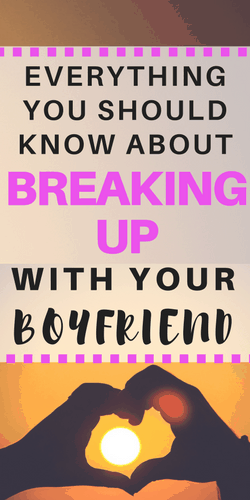 I hope these tips help you figure out the best way to breakup with your boyfriend. Before you sit your partner down to have “the talk” spend some time figuring out how you really feel and what you want. Spend some time journaling about what you want out of the relationship. Figure out if you would be willing to continue the relationship if changes were made or if you’re just ready to move on. It’s helpful to have a really clear idea of how you feel before you try talk to your partner. If you struggle with conflict it can be helpful to outline the key points you want to discuss with them before you talk to them face to face. If you’re not into writing or journaling try talking out the issues with a friend or therapist. I get terrible anxiety when I have to deal with conflict but knowing what I want to say ahead of time helps me stay calm. 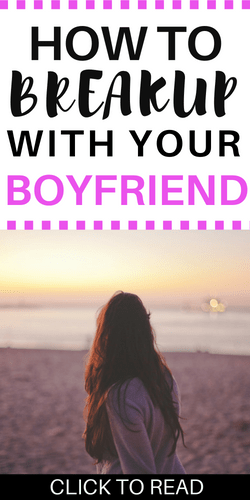 I feel better knowing I have a plan and it helps me make sure I know what I really want before I have a conversation with my partner. If you know in your heart that the best thing for you to do is end the relationship then be very direct. Don’t agree to give it another try if that’s not really what you want. Avoiding conflict isn’t going to get you anywhere. Ending a relationship can be sad and difficult but dragging it out is only going to make it worse. It’s better to be honest with your partner about how you feel even if it hurts their feelings. Otherwise, you’re just leading them on by giving them false hope that the relationship might be saved or that you’ll want to get back together in the future. You might spare their feelings in the moment but you will probably just prevent them from moving on in the long run. Make sure you’re always being as honest as you can be with your partner. Figure out if you’re comfortable talking or texting. I personally like to spend a period of time completely separated and without any communication before trying to get on friendly terms. Continuing to talk after you break up can present a ton of difficult obstacles and can make the breakup last even longer. If you don’t want to talk for awhile make sure you set that boundary with your ex and that you communicate that clearly. Once you set boundaries makes sure you are consistent and stick with them (don’t drunk dial them!). If you don’t want to see them and you need to make arrangments to get your stuff make sure you communicate that. I’ve dropped off peoples stuff with their roommates while they were at work before so we wouldn’t have to see each other. It’s OK if you don’t want to talk to them or see them for awhile. Just make sure you communicate that and stand by it. If your partner has ever been violent or abusive in any way you should do some extra safety planning. Often times abusive relationships escalate when the survivor decides to leave the situation. Please take any threats or safety concerns you have very seriously. Make sure to keep any documentation of any threats (save text messages and emails) and let your friends and family know what the situation is. If you feel unsafe to get a restraining order immediately. Your personal safety is not something you should risk and if you have any safety concerns take any steps that you can to minimize any risks or danger. Contact your local domestic violence shelter and tell them your situation. They will be able to help you make a plan to leave your situation as safely as possible. Many shelters also have connections for legal support too if you have a lease or kids together.